Your home wi-fi network might be a glorious model of high-speed, rock-solid internet connectivity, but is it safe? Even after you’ve got all of your various computers and devices hooked up, you still need to make sure the network’s secured against unwelcome visitors, and here’s exactly how to make sure it happens. If you’ve never ventured into the settings page for your router, now’s the time. You’ll find instructions in the manual that came with it or from your Internet Service Provider (ISP). First of all, change the default username and password required to gain access to the router’s on-board settings (not your wi-fi password) to something only you know. The available settings will vary depending on your router but you should at least be able to check up on the devices connected to your network and look for any suspicious behavior. You should also have the option to update your router’s firmware, which is an important part of making sure the most recent security patches and updates have been applied. Can you remember how many people you’ve given your wi-fi password out to? Your cousins, the mailman, the couple next door who came round for a night of board games? Not that we’re accusing any of those people of stealing bandwidth from you, but it’s good practice to keep a tight rein on the number of people who can gain access to your wi-fi. A simple password change instantly resets the number of people who can connect to your network back down to zero. Delve into your router settings and you should find it somewhere. Sure, it might be a pain having to get everything connected again, but it gives you a chance to kick any loiterers off your network and start again from scratch. 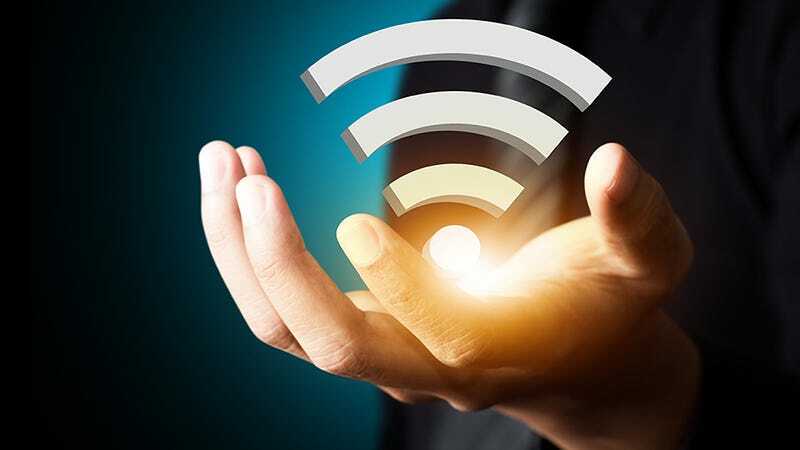 We’re all now well used to a flurry of available wi-fi networks popping up whenever we try and connect to the web, but you don’t have to broadcast your network to anyone passing by. There should be a router setting that enables you to hide the network, which means you need to know the SSID (service set identifier) and the password to get connected. As with changing passwords, it means slightly more hassle when you have to get a new tablet or Apple TV connected, but before too long you should have your SSID safely memorized. Meanwhile, to the casual observer it looks like you don’t have a wireless network broadcasting at all. Devices that are already hooked up will stay that way. There are those who won’t go online if it isn’t via a VPN, or Virtual Private Network—a dedicated piece of software that creates a secure tunnel between you and whatever you’re looking at on the web. It makes it much harder for anyone else (whether within reach of your network or not) to start spying on what you and your web browser are getting up to. You’ll find plenty of VPN comparison guides online, and the same goes for firewalls. While most of us make do with free security applications, or built-in OS tools, paying for extra protection is often worth it, and a dedicated firewall can help your router in the job of keeping unwanted traffic off your network, especially for all your smart home gadgets. You might just have split whatever you were drinking at the thought of living without wi-fi, but in some situations it’s a workable option, even if it’s just a temporary one. If you can get, say, your main computer and your smart TV wired straight into your router, you might find you can survive without a constant wi-fi connection on your phone after all. Why would you go to the hassle of doing this? Because it’s ultra-secure: no one can get on your network without direct access to your router, which should allow you to turn wi-fi on and off when you need to. Don’t forget you can always create a wi-fi hotspot from Windows or macOS if you need to update your phone’s OS or the apps that it’s running.